The ultimate sample playback solution? New sounds can be downloaded from within UVI Workstation. Univers Sons has announced the UVI Workstation, a free software application that enables you to play back and tweak sound libraries and samples. This is powered by a new version of the company's UVI Engine - the UVI Engine XT. The UVI Engine has been used in a wide range of sample-based instruments over the years, including releases from Spectrasonics, MOTU and UltimateSoundBank. The UVI Workstation is Mac- and PC-compatible and supports the VST, AU, RTAS and MAS plug-in formats. Supportive of unlimited parts and up to 64 MIDI Channels, it enables you to manage loops and instruments in the same interface. There's a decent selection of sound design tools, an effects section (this includes a convolution reverb) and a mixing section. Also noteworthy are the real-time timestretch algorithm and real-time loop syncing. The ability to import REX files, Apple Loops, AIFF and WAV files, meanwhile, makes the software eminently expandable. 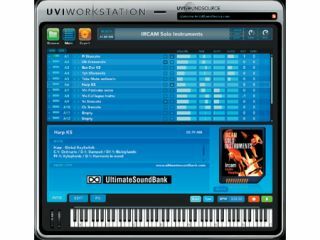 Speaking of which, we should mention that the UVI Workstation is compatible with all of UltimateSoundBank's UVI soundcards and also its Plugsound Pro sample library. Further soundpacks will be available for download via a new website - UVISoundSource.com - which can be accessed from within UVI Workstation. The good news is that you can try the software today - Beta versions have already been posted on UVISoundSource.com, and you can also download a 415MB soundbank to get you started.